Foggy is a globetrotting adventurer! He is on a mission to raise awareness of M.E./C.F.S. round the globe. He raises awareness with every paw-step! Foggy’s P.A Sally has had M.E./C.F.S. since 2007. Since M.E. Foggy Dog was created in July 2014. Foggy has raised £10,573 for M.E./C.F.S. research and travelled 455,044 miles! Team Foggy raises awareness by (nearly!) any means necessary. They have already been on the telly, radio, in newspapers (online and in print), have held awareness events, have had wonderful people do physical challenges to raise funds, and have built a mini-empire using social media platforms. We are always open to new opportunities; get in touch if you can help to spread Foggy love even further! Foggy has a bucket list, Goofy is his doggy idol, and his favourite treats are a cuppa (milk, 2 sugars) and a bag of cheesy puffs! ME Foggy Dog was inspired by Sally’s real-life dog Patch. He was incredibly supportive with snuggles and wet nose nudges when she was having particularly bad M.E./C.F.S. flare ups. Patch was Foggy’s best friend. 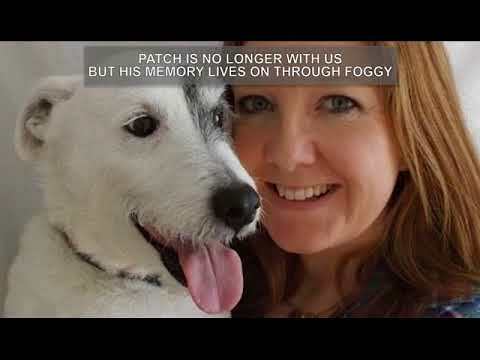 Patch passed away on 25 October 2017 but his memory lives on through Foggy.